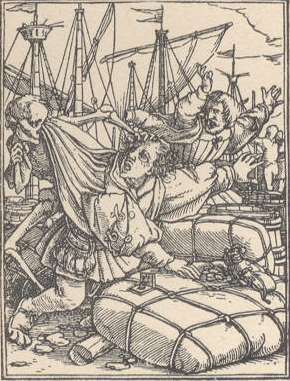 An artist’s rendering of Ramalingam’s appearance. However, it must be noted that Ramalingam wore footwear and emphasized the importance of doing so. The “Abode of True Charity” (est. 1867, Vadalur, Tamilnadu, India), which provides free food for the hungry to this day, is on the left. 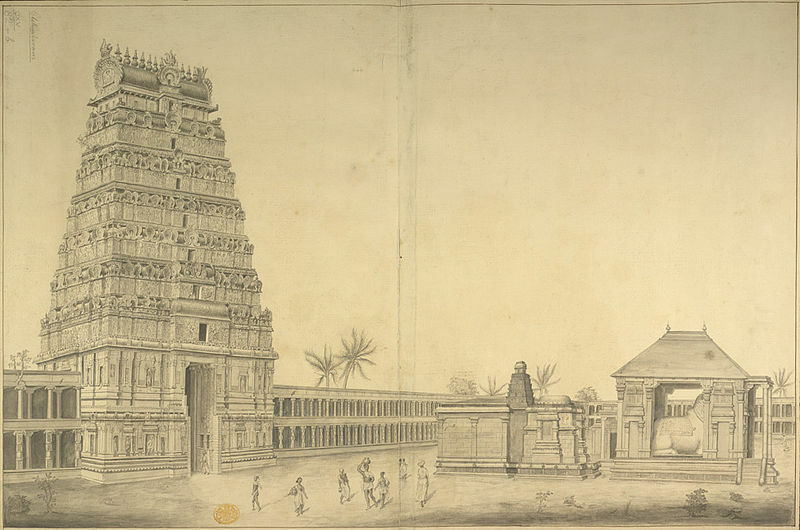 The remarkable and original “Hall of Truth-Knowledge” (est.1871, Vadalur, Tamilnadu, India), a place of contemplation and worship of ARUTPERUMJOTHI, designed by Ramalingam without the benefit of any training in architecture, is on the right. In this thread, I intend to make a series of posts on Ramalingam and his ascent to an immortal life and consciousness. Chidambaram Ramalingam was born on October 5, 1823, at the hamlet of Maruthur, in the district of Cuddalore, and in the state of Tamilnadu, South India, to a pious Tamilian couple, Ramayya Pillai and Chinnamai. Ramayya Pillai was a school teacher. Ramalingam was their fifth and last child. When he was five months old, they took Ramalingam to the great temple city of Chidambaram, Tamilnadu. The temple (est. 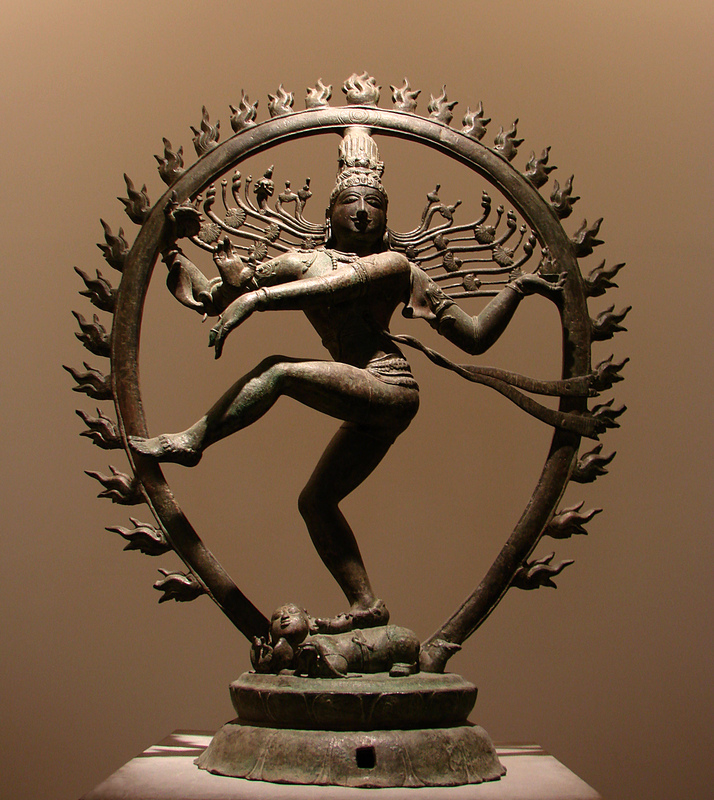 12th century CE) in Chidambaram is the only one in which the Hindu deity Siva is represented anthropomorphically in the form of Nataraja (“Lord of Dance”) or the performer of the “cosmic dance”, the dance of the creation, regulation, and dissolution of the cosmos. There is a sacred place to the left of the sanctum sanctorum in the Chidambaram temple. This is the “Chidambara Rahasyam”, or “The Secret of Chidambaram”, and contains golden Bilva leaves, symbolizing the presence of Siva and Parvati, covered by a curtain. The Tamil Śaiva saint Mānikkavācakar is said to have disappeared here in a blaze of light in the 9th century, CE. The infant Ramalingam uttered a cry of delight and laughed when the curtain was drawn to the side. Instead of seeing the wall behind the curtain, he had a vision of the transcendent space in which all things have their origin! In a poem composed in his thirties, Ramalingam vividly recollected and celebrated this incident of his infancy. In 1824, in Ramalingam’s infancy, the father, Ramayya Pillai, passed away. In 1825, the family headed by the elder brother Sabapathi Pillai relocated to the bustling city of Chennai, Tamilnadu, South India. Ramalingam was a child prodigy. He was precociously inclined to devotional poetry. As a boy, he was drawn to the hymns of the Tamil Śaiva saints and showed a special fondness for Mānikkavācakar’s classic of devotional poetry, the Tiruvācakam, and the poems of Sambandar (7th century CE). 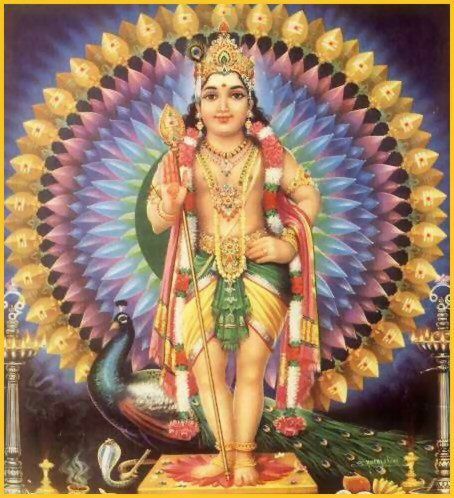 At the age of nine, Ramalingam himself began to compose devotional poems on one of the chief deities of the Tamils, the ever-youthful Lord Muruga who is also the patron god of the Tamil poets. His elder brother Sabapathi Pillai, a Tamil scholar who made a living by giving religious discourses, entrusted Ramalingam to the care of a well-known teacher, Kanchipuram Sabapathi Mudaliar (1792 – 1871), for purposes of his formal education, but Ramalingam, despite his precocious facility in the Tamil language, showed little interest in formal school studies and a complete indifference to rote learning of texts and scriptures. In a poem composed later in his life, Ramalingam dismissed academic education, including, as a means of livelihood, the formal study of religious scriptures such as the Vedas, Āgamas, and Purāṇas, as “education merely for the marketplace”, or education merely for monetary gain in the marketplace, and urged the pursuit of the true education which leads to the conquest of death. Sabapathi was disappointed and angry at Ramalingam’s indifference to academic study, and, having failed to persuade him to take his formal education seriously, resorted to the drastic punishment of expelling the boy from his house, and instructed his wife not to provide food should he visit the house surreptitiously. This was Ramalingam’s earliest experience of suffering from hunger, a form of suffering he later classified as the worst form of pain and harm a sentient being can undergo. Indeed, the alleviation of the starvation, the suffering from acute hunger, of those who have failed to obtain food by their own efforts, is the moral act par excellence, the highest form of compassion, in the ethics of Suddha Sanmargam. Sabapathi’s wife, Parvathi, was compassionate enough to unobtrusively feed Ramalingam whenever he visited the house desperately hungry. At her urging, Ramalingam agreed to pursue his studies, but on the condition that a separate room in the house was given to him for that purpose. Sabapathi eventually yielded to his wife’s entreaties on behalf of Ramalingam and a small room upstairs was given to him for his studies. However, Ramalingam did not use his room for drab studies designed to fulfill the qualifications for a citizenship of the marketplace. Instead, he began to compose poems and songs in praise of the deities (primarily, Siva and Murugan) of the great temples he used to visit in the vicinity of Chennai in his frequent wanderings away from home. He also asked for and installed a lamp and a mirror in his room and began to worship the light reflected in the mirror as a symbol of ultimate reality. It is remarkable that this conception and worship of ultimate reality in the form of JOTHI, or LIGHT, which Ramalingam embraced even as a boy, is exactly the one he was to prescribe decades later, in the maturity of his spiritual enlightenment, as the required form of contemplation and worship at the sublime “Hall of Truth-Knowledge” he designed, without benefit of any training in architecture, and established in Vadalur, Tamilnadu, in 1871. It should be noted that this remarkable building has no images or idols of any Hindu deity in its interior or exterior. It is certainly not recognizable as a typical Hindu temple or place of worship. This contemplation of ultimate reality in the form of JOTHI, or LIGHT, was also the practice he recommended to those who were with him shortly before his entry into a room in a house in the hamlet of Metukuppam near Vadalur, Tamilnadu, on January 30, 1874, and his subsequent mysterious disappearance from the ken of mortals. All this suggests a striking continuity in the development of his understanding of ultimate reality. In his own account of some of his experiences in boyhood and youth, provided in his great tetralogy of “Petitions of Suddha Sanmargam“, Ramalingam praises ARUTPERUMJOTHI for guiding him away from the false paths based on anthropomorphic, mythological conceptions of divinity or ultimate reality, and setting him on the path of true theism even in his boyhood. The fact that his early devotional poetry invoked the deities of some of the great temples of Tamilnadu is best explained in terms of his adherence, in these early stages, to the traditions of Tamil devotional poetry, and, particularly, the traditions of Tamil Śaiva poetry. It does not imply that he seriously espoused any anthropomorphic conceptions of divinity or ultimate reality even in these early stages of spiritual development. An artist’s rendering of Ramalingam’s appearance. However, it must be noted that Ramalingam wore footwear and emphasized the importance of doing so. The “Abode of True Charity” (est. 1867, Vadalur, Tamilnadu, India), which provides free food for the hungry to this day, is on the left. 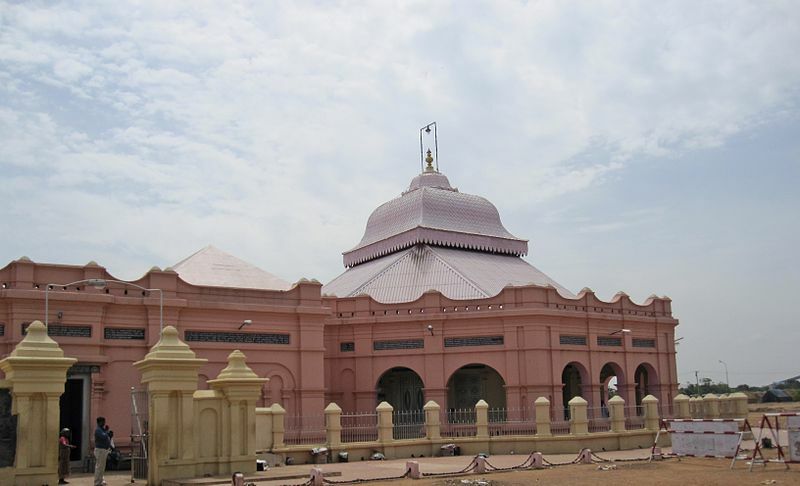 The remarkable and original “Hall of Truth-Knowledge” (est.1871, Vadalur, Tamilnadu, India), a place of contemplation and worship of ARUTPERUMJOTHI, designed by Ramalingam without the benefit of any training in architecture, is on the right. Chidambaram Ramalingam (1823 – 1874) was a profound and revolutionary Tamil poet, moralist, and mystic whose spiritual development and enlightenment culminated in the vision of a new path, Suddha Sanmargam (“The pure and true path”), to overcome the physical, mental, and spiritual afflictions of humanity. This blog will expound, clarify, and analyze the authentic central teachings of Ramalingam based on a selection of his poems and prose writings in their original versions in Tamil. Suddha Sanmargam, the way of Ramalingam, is a pure and true theistic path which requires, in his own words, the rejection of the impure and false pathways of the extant religions, their conflicting and fragmented sectarian creeds, dogmas, obscure or inconsistent “holy scriptures”, theologies, narrow or limited goals, absurd, wasteful, or cruel rituals, and exclusive, divisive, and oppressive social norms and practices. In the great tetralogy of Suddha Sanmarga Vinappams, or Petitions of Suddha Sanmargam, Ramalingam clearly affirms that the extant religions and the philosophical, metaphysical, or theological systems of Vedanta, Siddhanta, etc., are obstacles to the realization of the truths and values of Suddha Sanmargam, and, that, therefore, one must give up adherence to these religions and philosophical, metaphysical, or theological systems in order to realize the truths and values of Suddha Sanmargam. It is important to note that Ramalingam used the Tamil word “கலை” (kalai) to refer to these texts. This word has many meanings, but in this context it means “the works of the learned arts of discourse” and implies the central role of the play of imagination and language in the constitution of these texts and the traditions based on them. It must be acknowledged here that the available version of பேருபதேசம் or “The Great Discourse” is not a work of Ramalingam, but an account, by one of those who were present, of a discourse given by Ramalingam at the time of hoisting the horizontally bicolored flag (consisting of yellow and white colors) of Suddha Sanmargam sometime in October 1873. But it contains many statements consistent with those in the authentic central writings of the later Ramalingam, e.g., Jivakarunya Ozhukkam or the essay on “The Ethic of Compassion for Sentient Beings”, Arutperumjothi Agaval or “The Verses on the Immense Light of Compassion”, and the tetralogy of “Suddha Sanmarga Vinappams” or “The Petitions of Suddha Sanmargam”. In this blog, I will adhere to the principle that only claims which are contained in these writings, or are consistent with them, are representative of Ramalingam’s mature teachings and the path of Suddha Sanmargam. In an account of another discourse (திருவருண் மெய்ம்மொழி) by Ramalingam, he is said to have dissuaded his audience from adherence to Saivism, Vaishnavism, Jainism, and Buddhism. I will explore his grounds for rejecting these religious traditions and metaphysical or theological systems in future posts. It should be noted that although Ramalingam does not mention Judaism, Islam, and Christianity in this context, his grounds for rejecting the Hindu, Jain, and Buddhist religious traditions and their metaphysical or theological systems, apply mutatis mutandis to all the other religious traditions. Suddha Sanmargam affirms that ultimate reality is ARUTPERUMJOTHI (அருட்பெருஞ் ஜோதி), a being and person whose nature is immense, boundless LIGHT, and incomparably great compassion (தனிப்பெருங் கருணை). ARUTPERUMJOTHI creates, organizes, sustains, regulates, develops, destroys, veils or obscures, and unveils or illuminates, all universes and their constituents. Suddha Sanmargam also admits the existence of a variety of types of supernatural beings who wield powers, vastly greater than any posssesed by humans, to bring about creation, preservation, development, destruction, etc., in the cosmos, but who are all subject to the omnipotent powers of ARUTPERUMJOTHI. As Ramalingam declares in his magnum opus ARUTPERUMJOTHI AGAVAL, or “Verses On The Immense Light of Compassion“, it is ARUTPERUMJOTHI who creates the “creator godheads”, protects the “protector godheads”, develops the “developer godheads”, exercises the power of obscuring or veiling the understanding of the “obscuring godheads”, illuminates the understanding of the “illuminating godheads”, and brings about the dissolution of the “destroyer godheads”. I will elaborate on Ramalingam’s “supernaturalism” in other posts. Suddha Sanmargam affirms that the end or goal of human life is to achieve knowledge and unitive experience of ARUTPERUMJOTHI, and, thereby, to attain a blissful state of deathless embodied existence, by means of a transfiguration of the physical body, or the possession of a new “supraphysical” body, free of all limitations and afflictions. This is an enlightened and blissful life led by an embodied individual transfigured by his or her unitive experience and knowledge of ARUTPERUMJOTHI, not an obliteration or cessation of individual life and consciousness in a vacuous state of Nirvana or Moksha. This “great life without death” is the state of enlightenment or liberation envisaged in Suddha Sanmargam. The attainment of this “great life without death” is a function, not of our own efforts, but of the incomparable compassion of ARUTPERUMJOTHI. The point of effort, in this context, is self-purification, to become completely receptive to the omnipotent compassion of ARUTPERUMJOTHI. According to Suddha Sanmargam, the path to this supreme goal of attaining “the great life without death” involves the cultivation of total faith in the existence of ARUTPERUMJOTHI; the sustained practice of the ethic of compassion and vegetarianism leading to the eventual realization of unity with all life; the practice of non-discrimination, or the rejection of discrimination based on caste, religion, nationality, race, or gender, or even, in the context of refraining from killing and engaging in the alleviation of starvation, species membership; purification of the senses by avoiding the sight of cruel actions or their results, refraining from hearing cruel words, listening with concentration to songs, hymns, and forms of music which express joy and devotion, engaging in pleasant speech, and touching with care and compassion; sustenance and regulation of the body by means of the practice of moderation in food consumption, sleep, sexual activity, physical work, and exposure to the elements of nature; strengthening of the body by recourse to the appropriate medicine in the face of illness; the purification of the mind by means of meditation on the attributes of ARUTPERUMJOTHI and the cultivation of intense devotion and love toward that supreme being. I will clarify and elaborate on all these aspects of the Yoga of Suddha Sanmargam in subsequent posts on this blog. Suddha Sanmargam is unlike the extant religious traditions. There are no “holy scriptures” of Suddha Sanmargam. It is a pathway to immortality revealed by ARUTPERUMJOTHI to a pioneer, Chidambaram Ramalingam. Of course, the later prose and poetry of Ramalingam constitutes an eloquent and reliable source of Suddha Sanmargam, but they are not like religious scriptures and ought not to be treated as such. Obviously, and unlike the alleged status of the Vedas, they are not “authorless revelations”. They express the aspirations, experiences, and enlightenment of Ramalingam. There is no formal “lineage” of Suddha Sanmargam. Ramalingam did not establish himself as a “Guru” and claimed no disciples. He was averse to the appellation of “swami”. When some of his friends intended to publish a collection of his poetry under the name “Ramalinga Swami”, he forbade them to do so and said that the title “swami” smacked of ostentation and pretense. He did not wear ochre robes. He was not affiliated with any monastic order, or any religious order or institution. He addressed the members of the Sangha or community of Suddha Sanmargam as his friends, not disciples. He did not set himself up as a savior or “avatar”. The goal of Suddha Sanmargam is to realize ARUTPERUMJOTHI, not to worship Ramalingam as a “savior” or “avatar”! In fact, such worship of Ramalingam is not even prescribed as a means in Suddha Sanmargam! Ramalingam himself was avowedly and deeply distressed at the fact that many of his followers tended to deify and worship him instead of striving to worship and realize ARUTPERUMJOTHI! Suddha Sanmargam is actually a Weltanschauung or worldview which includes a theology, cosmology, biology, human physiology, a system of herbal medicine and care of the body, cognitive psychology, ethics, theodicy, and soteriology. In the extant writings of Ramalingam, I find a reasonably good basis for an adequate reconstruction and elaboration of all these aspects of Suddha Sanmargam. It is my objective in this blog to accomplish this task of reconstruction and elaboration of the worldview of Suddha Sanmargam.